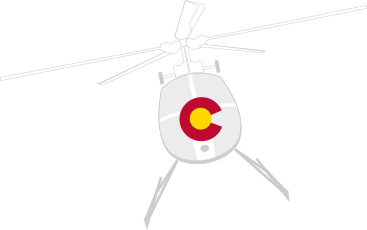 Colorado Helicopters, Inc. (CHI) holds the FAA Supplemental Type Certificate (STC) and the Parts Manufacturing Authority (PMA) for a unique side hook bracket. The side hook bracket is rated for side pull operations up to a maximum of 1,900 pounds and is intended to be used for pulling sockline on powerline construction projects. Once the initial installation is completed, a cargo hook can be moved from the belly mount position to the side mount position in less than one minute. - The cargo hook manual release cable must be permanently replaced with the longer one shown (A). CHI holds the STC and PMA for this longer cable. - The placard (B) is required by the FAA in the USA, and is mounted on the side of the aircraft near the left step hole. - The quick release pin (C) replaces the bolt that holds the cargo hook on the belly. This completes the initial installation. The same quick release pin (C) that holds the cargo hook to the belly is used to mount the cargo hook to the side mount bracket. The breakaway swivel (E), also STC certified, is placed between the cargo hook and the sockline to protect the airframe of the aircraft from overload. The calibrated breakaway pin (F) will break, allowing the cable to fall away from the aircraft. This pin is easily replaceable, allowing operations to quickly resume. We also provide an FAA-approved Flight Manual Supplement for the Hughes, McDonnell Douglas. and, MD Helicopter Pilot Flight Manuals. Sockline pilots love the side mount bracket. It allows a quick change between carrying passengers and pulling sockline. The helicopter doors can be left on or taken off. If it is cold outside, pull sockline with the doors on and stay warm. No need to remove the rear seat/s as with older systems. Makes it very easy and quick to transition from pulling sockline to hauling lineman or passengers. When pulling hard on the sockline, the cyclic is centered with full cyclic authority. If a breakaway does occur, no unusual attitudes result, and the pilot can easily and rapidly come to a normal hover.